The unpredictable bounce of these oddly-shaped rubber balls forces athletes to make split-second decisions in order to catch them. The random bounce helps train reaction time and hand-eye coordination, improving overall coordination and depth perception. Throw the balls against any hard surface for multidimensional drills. Two Sizes available, each sold separately. Jumbo Reflex Ball (4 inch, model 30560) is larger, and has a softer bounce making it easier to catch. 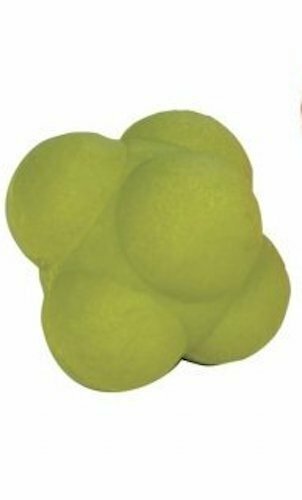 This product is the Regular Reflex Ball (3 inch) has a more compact design producing faster, more erratic bounces and is harder to catch. Dense rubber. Green. Included: 1 regular 3-inch diameter Reflex Ball. Jumbo 4-inch ball sold separately. Since 1986, Power Systems' passion for fitness has been fueled by our customers. Power Systems is committed to ensuring people have the tools to lead active lives with professional-grade products, cutting-edge educational materials, and elite customer service. “Power Your Potential” is the philosophy that guides everything Power Systems stands for.